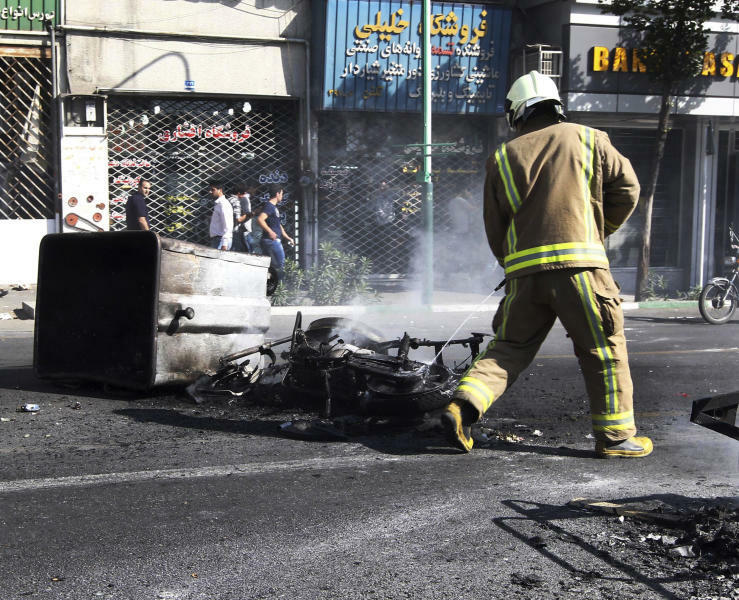 This photo, taken by an individual not employed by the Associated Press and obtained by the AP outside Iran shows, Iranians stand in a street as a garbage can is set on fire, in central Tehran, near Tehran's old main bazaar, on Wednesday, Oct. 3, 2012. Police threatened merchants who closed their shops in Tehran's main bazaar and launched crackdowns on sidewalk money changers on Wednesday as part of a push to halt the plunge of Iran's currency, which has shed more than a third its value in less than a week. (AP Photo) EDITORS NOTE AS A RESULT OF AN OFFICIAL IRANIAN GOVERNMENT BAN ON FOREIGN MEDIA COVERING SOME EVENTS IN IRAN, THE AP WAS PREVENTED FROM INDEPENDENT ACCESS TO THIS EVENT. 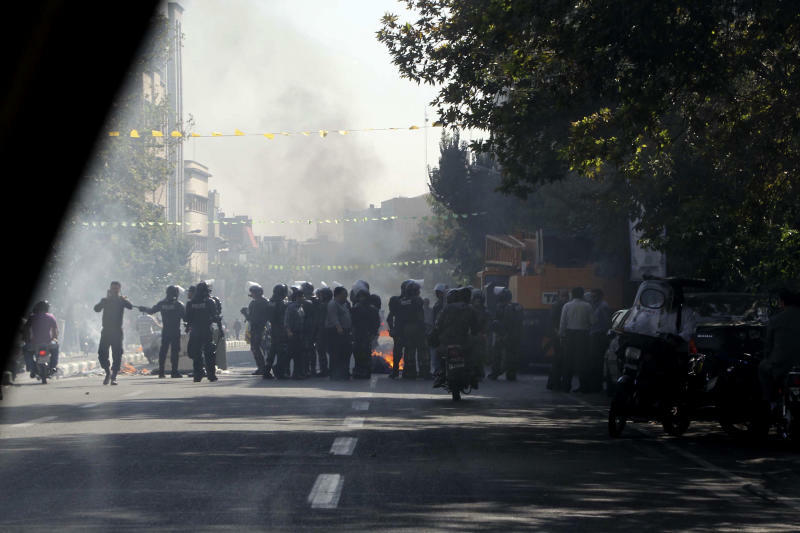 TEHRAN, Iran (AP) — Iran deployed riot police at key Tehran intersections on Thursday, after tensions flared over the nation's plunging currency in the most widespread display of anger linked to the country's sanctions-hit economy. The show of force reflects the authorities' concerns in the wake of sporadic protests Wednesday over the plummeting currency, which has sharply driven up prices. It has also put Iranian leaders under the most pressure from dissent since crushing the opposition movement after the disputed re-election of President Mahmoud Ahmadinejad in 2009. Most shops in Tehran's main bazaar were reopened on Thursday, the first day of the Iranian weekend, and no unrest was reported. Many bazaar merchants had closed their shops the day before and authorities reported arrests amid efforts to clampdown on black market money exchangers, who effectively set the rates around the country. Trash bins were set ablaze during sporadic confrontations with security forces. The Prosecutor's Office in Tehran said 16 people have been detained for "disrupting" the currency — an apparent reference to speculators trying to take advantage of the rial's declining value. Iran's rial has lost nearly 40 percent of its value against the U.S. dollar in the past week. The rate Thursday — about 32,000 rials for the dollar — was a bit higher than the record low earlier this week. The semi-official Mehr news agency reported that the heads of several business guilds in Iran — production, distribution and technical services — all agreed that shops will also reopen on Saturday, after the Iranian weekend. 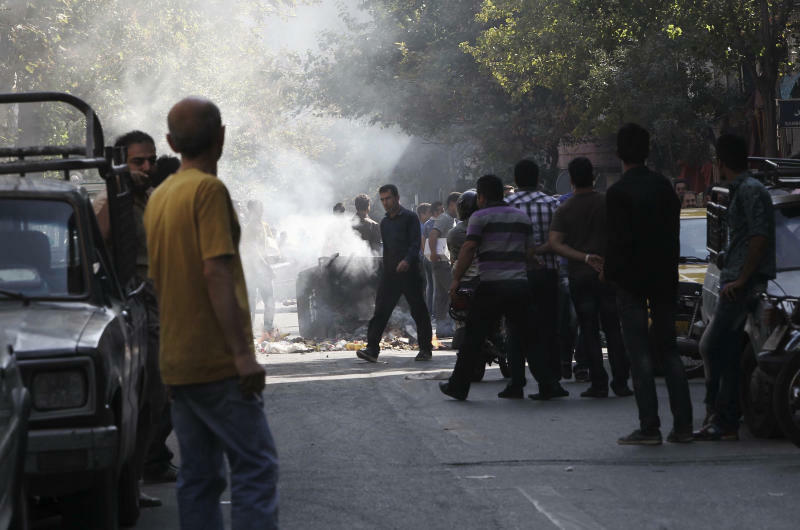 The guilds have asked police to provide protection and security for the shops at the Tehran bazaar. According to Mehr, the guilds said "the main problem is government's economic performance" and pledged loyalty to the ruling system. Ahmadinejad critics say his government has added to the frenzy to dump rials with policies such as limiting bank interest rates — which led depositors to pull their cash in fear it wouldn't keep pace with inflation. But officials in Washington claim the plummet of the rial is a combination of Iranian government mismanagement and the bite from tighter sanctions, which have targeted Iran's vital oil exports and cut off access to international banking networks. Both measures have reduced the amount of foreign currency coming into the country. "They have made their own government decisions, having nothing to do with the sanctions, that have had an impact on the economic conditions inside the country," Clinton told reporters Tuesday. She said the sanctions have had an impact as well, but that could be quickly remedied if the Iranian government were willing to work with the international community "in a sincere manner."